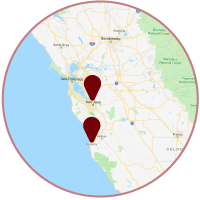 Whether you have big plans about a beautiful new garage door or just need a reliable repair, you can trust Aaron Overhead Doors for garage door services in the San Jose and Monterey, CA area. Garage Door Installation – Choose from a stunning variety of doors and get a safe, dependable installation. Opener Installation – Get an opener that offers the latest safety and convenience features. Garage Door Repair – We can fix any garage door problem with ease. Spring Repair – Just discovered your garage door won’t go up all the way? We can help. In San Jose, CA, call us at 408-684-6791; in Monterey, CA call 831-290-1765. Or schedule your free consultation below.